These 30 minute veggie enchiladas are loaded with protein, fiber and fresh flavors! Your family won’t even miss the meat, I promise. 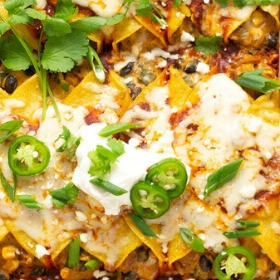 How do I make loaded vegetarian enchiladas? You’ll start by sauteing red onion and poblano pepper in olive oil. Then add garlic and and sliced green onion and saute for another minute. 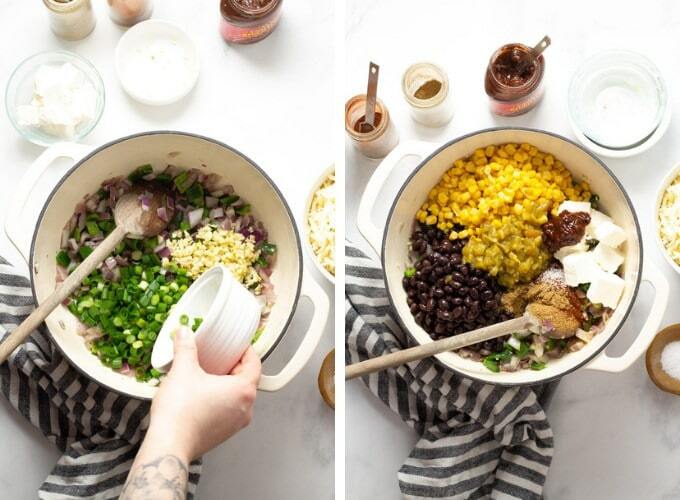 Then stir in black beans, corn, cream cheese, chiles in adobo and spices. Add shredded pepperjack cheese and stir to combine. 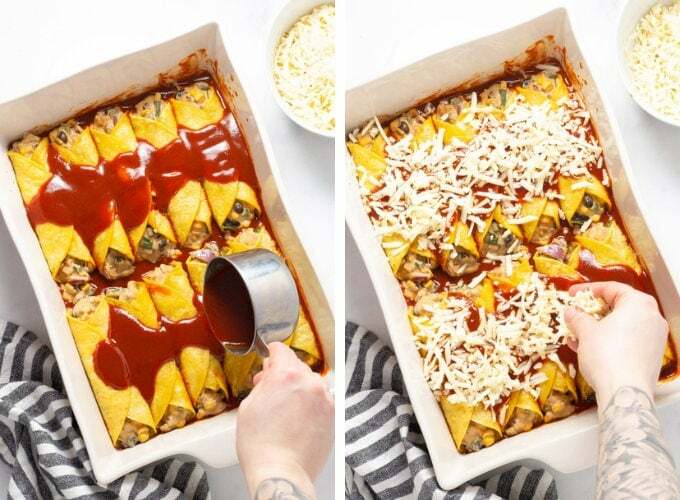 Spread enchilada sauce across the bottom of a 9×13″ pan. Then lightly fry the corn tortillas in just a bit of hot oil in a saute pan. Fill tortilla with a heaping 1/4 cup of filling and tightly roll the enchilada away from you. Place into the baking dish and repeat with remaining tortillas and filling. Cover enchiladas with another layer of sauce and a sprinkle of shredded cheese. Bake in a 400 degree oven for 15 minutes. Then garnish with sliced green onion, fresh chopped cilantro and sour cream. 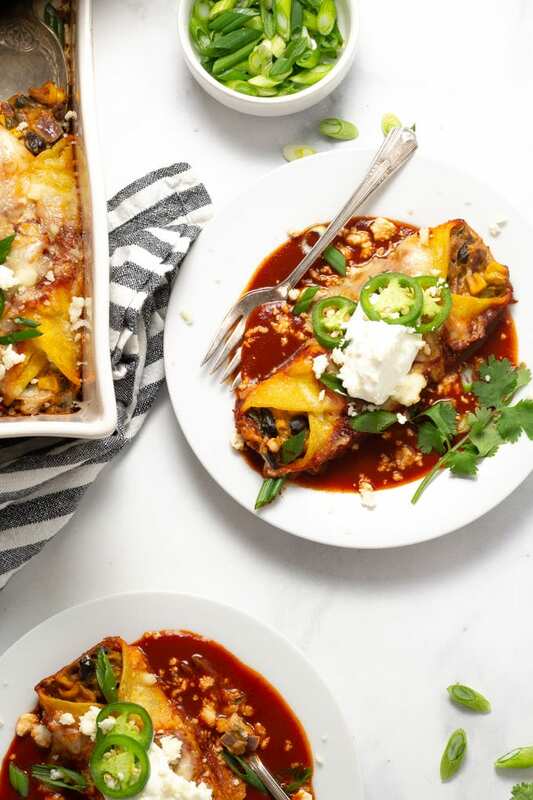 Can I add chicken or beef to these vegetarian enchiladas? Sure! Feel free to add ground beef or shredded chicken to this dish if your family would prefer it. However, the flavors of this dish are amazing as is, so I’d urge you to give it a try and add a meatless meal to your family’s dinner routine! 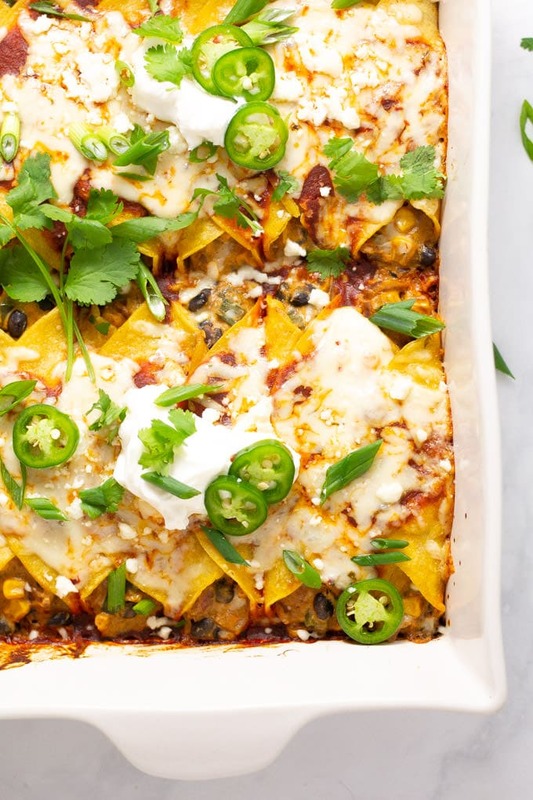 Can I make these vegetarian enchiladas ahead of time? Sure can! These enchiladas freeze like a dream! 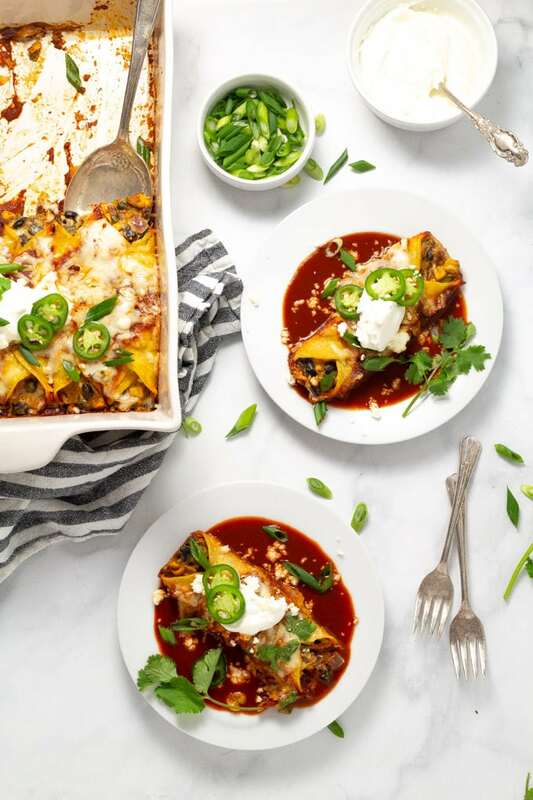 This recipe makes two 9×13″ pans or 20 enchiladas so I like to bake one pan for dinner and freeze the other for a busy weeknight when I don’t have time to make dinner. 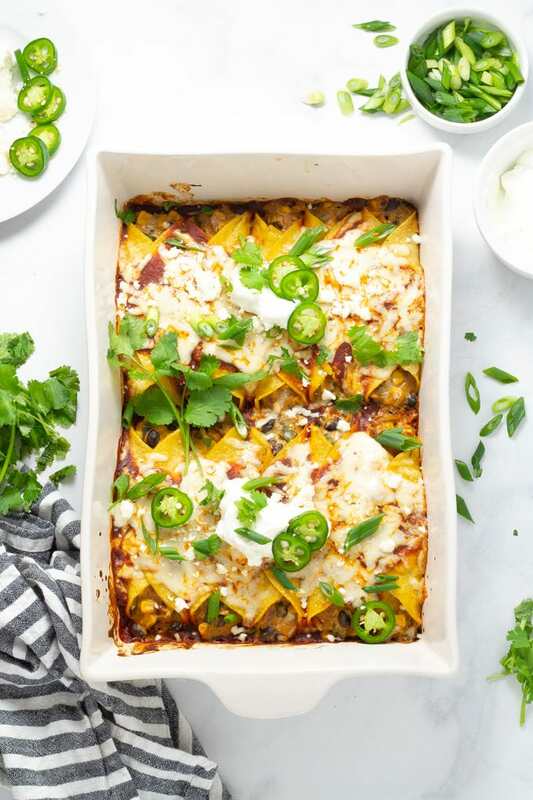 These enchiladas can go right from freezer to your oven when you’re ready to bake them! Use corn tortillas. 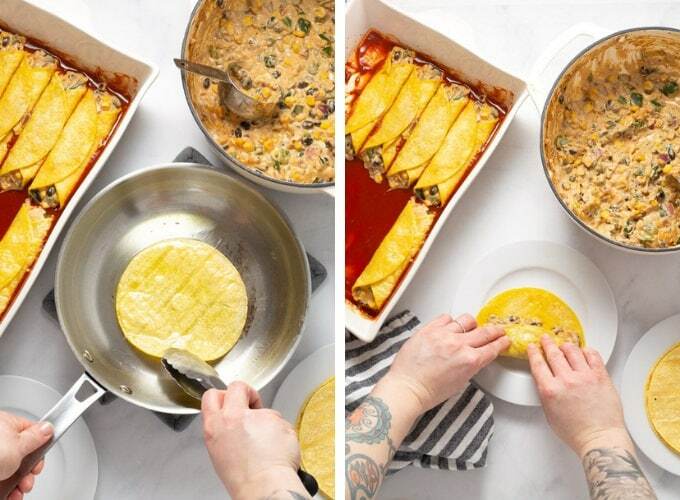 Flour tortillas are great for tacos, but corn tortillas are best for enchiladas. They will hold up to the sauce better than their flour friends. Don’t forget to fry the corn tortillas! Corn tortillas taste best when fried in just a bit of vegetable, canola or olive oil. It doesn’t have to be a ton of oil, but a quick sizzle in the skillet is going to boost the flavor and make them much more pliable and easier to work with! You can omit the cream cheese if you’re not feeling extra cheesy today. The cream cheese adds another layer of richness and a nice, smooth texture. But feel free to leave it out if you’re looking to skip the calories or go for a more traditional enchilada. This recipe makes two 9×13 pans of enchiladas. Feel free to cut the recipe in half if you’d just like to make one pan. 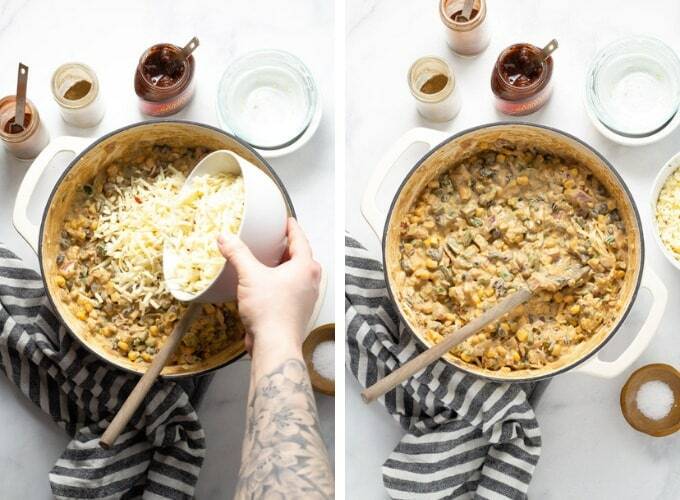 But honestly, it’s so easy to throw together it’s best to just make both pans, eat one now and freeze one for later. 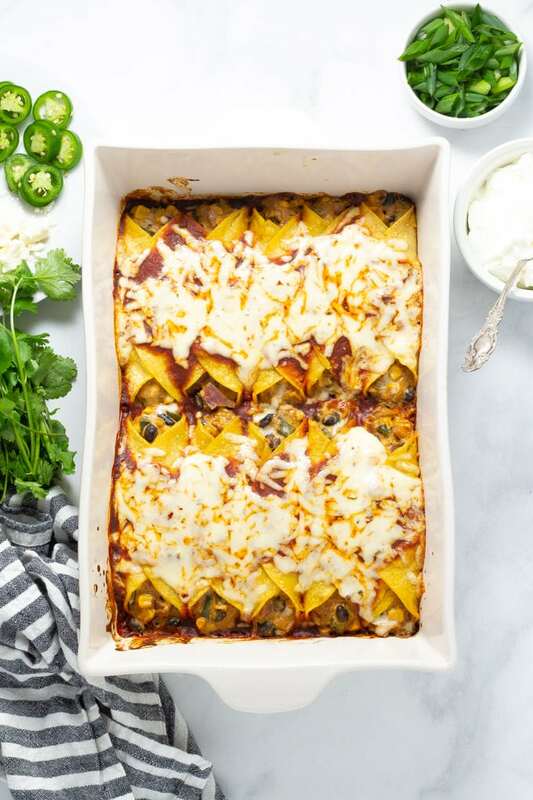 These enchiladas are a great freezer meal! As mentioned above, these enchiladas do great in the freezer. Bake frozen enchiladas (covered with foil) for 30 minutes in a 400 degree oven. Remove foil and bake for another 10-15 minutes or until the cheese on top is melted and the enchilada sauce is hot and bubbling. These 30 minutes veggie enchiladas are loaded with protein, fiber and fresh flavors! Your family won’t even miss the meat, I promise. Preheat oven to 400 degrees. Heat a tablespoon of olive oil in a large sauté pan over medium heat. Add onion, pepper and a pinch of salt and pepper and sauté for about 4 minutes. Add garlic and green onion and sauté for another minute. Then add cumin, chili powder, beans, corn, chiles in adobo, cream cheese and another pinch of salt and pepper. Stir to combine. Remove pan from heat and stir in 1/2 shredded pepperjack. Pour half a cup of enchilada sauce into the bottom of each 9×13 pan. Heat remaining 2-3 tablespoons olive oil in a saute pan over medium heat. Once the oil is hot (but not smoking) add one corn tortilla and cook for 2-3 seconds on each side. Immediately after frying, fill tortilla with 1/4 cup filling, roll up enchiladas and place them seam side up in the baking dish. Continue with remaining tortillas until they are filled. Pour another 1/2 cup of sauce over each pan of enchiladas. Divide remaining cheese between the two pans of enchiladas and bake for 15 minutes. Garnish with green onion and cilantro and serve with sour cream. This post was originally published in December of 2017. 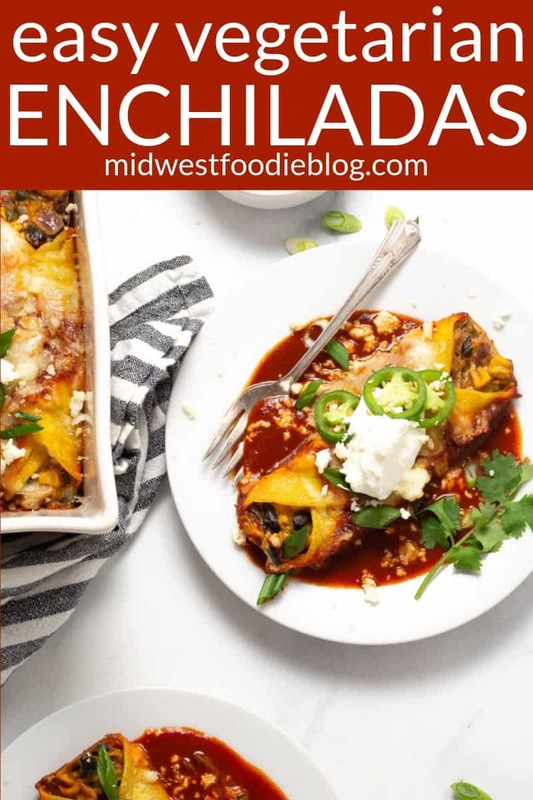 It was updated in March of 2019 to include process shots, detailed instructions and tips for making the best veggie enchiladas every single time! They look amazing!! Good luck with your 2018 goals. Thank you! So far things are going great, but not perfect 🙂 Good things there’s still quite a bit of the year left! The perfect make ahead meal for next week’s meal prep! Your family is going to love this meatless meal! Mm, yummy! I will be giving these a try next week – love a good enchilada!! Me too! I love them so much I’m making a black bean and salsa verde version this weekend!